- The range of communication in the Mesh Network is up to 1 Km. line of sight. - The communication between Master to Slave & Slave to Slave Clocks is in Mesh Network & hence the Master Clock can be away from the Slave clock up to 1 Km in distance & yet show synchronized time. When every clock throughout your facility is synchronized, workflow and efficiency within your facility improves, and improved workflow translates into better patient care. That's why ADNAN ENGINEERING offers complete line of timekeeping solutions to ensure your hospital facility is always on-time. This is yet another range of GPS clock, that is very commonly used all over the world. These have the same common features of accuracy and crystal clear display. These are arranged in a specified hierarchy. They can be easily synchronized and are user friendly. In a big factory/public place like railway station, synchronization of the clocks is a must. Master Slave clock achieves this. The time display in the entire slave clock will be the same as set in the master clock. - Time synchronization is required. - The MASTER clock connected to GPS. - Available in various sizes different colors. The goodwill, we are enjoying in this respective field is due to our exceptional quality LED Master Slave Clock. This clock is designed and manufactured with the use of optimum quality components at our advanced manufacturing unit. 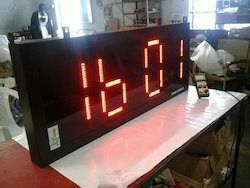 Our offered clock is widely used at public places, malls, shops and many other commercial places. These Master and slave clocks are accurate in showing time. Supply Voltage: 230V AC±15%, 50Hz. Accuracy: Better Than 15 Seconds/Month. Visibility: 100 Feet For 2.3 Display.